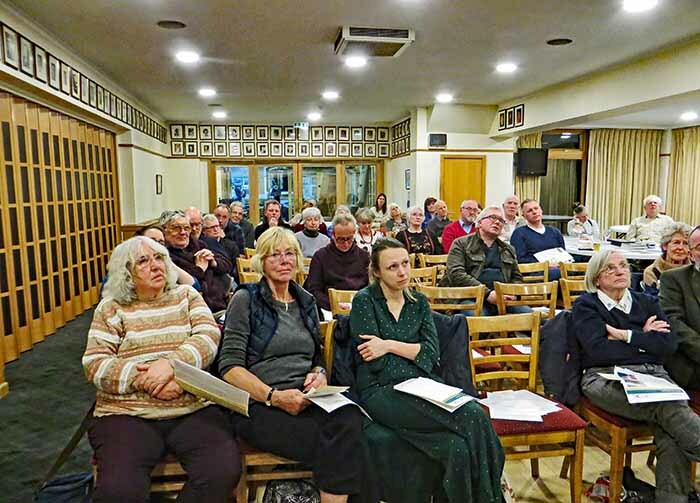 The Friends of Wanstead Parklands (FWP) last week held their annual general meeting (13 March 2019). 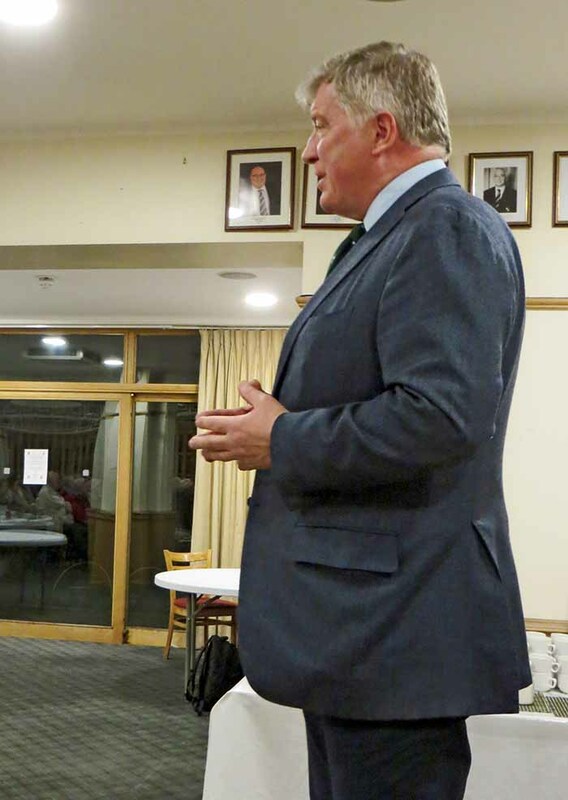 About 40 members and supporters braved a rather cold evening, and were rewarded by presentations from Colin Buttery, the City of London’s Director of Open Spaces, and Nicholas Munday, the newest of Epping Forest’s four Verderers. The meeting was chaired by Tricia Moxey in the absence of Chairman John Meehan, who had been delayed in returning from holiday. There was accordingly no Chairman’s report, though Mrs Moxey said she hoped it would be possible to circulate it by email following the meeting. The evening began with the re-election of the existing committee, who also act as trustees of the charity. 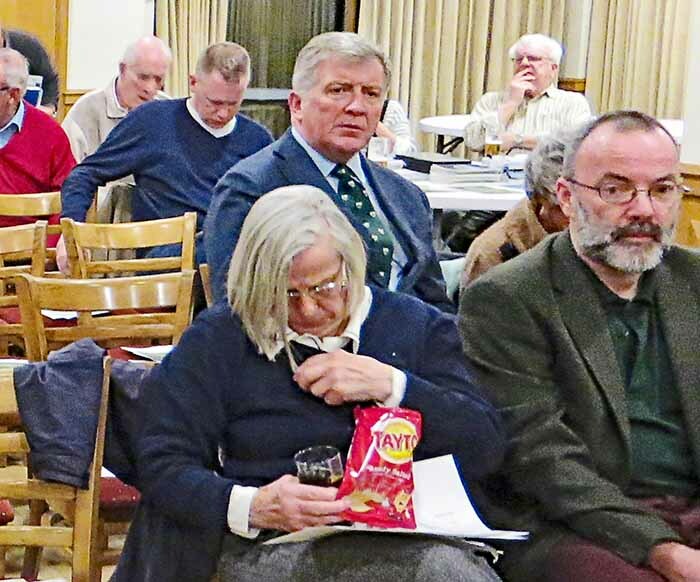 The four candidates for co-option were also unchanged from the previous year, though it was emphasised that anyone was welcome to attend and contribute at the Friends’ monthly meetings. The Honorary Treasurer’s report had been circulated at the meeting. Total funds now stood at £12,800, an increase of roughly £1,500 on the previous year. Gill James asked for volunteers to help at The Temple. For the moment its opening hours had, unfortunately, been reduced. Until at least July it would be now open only one weekend in four, with a single member of Epping Forest staff on duty, who would benefit from support. Helping there was not onerous, and in fact was quite enjoyable. Mrs James asked anyone who was interested to leave their names. On some weekends there would be special events going on, and there would be a three-day opening over Easter. Opening hours would be reviewed in July. Helen Robertson, Centre Manager for the Field Studies Council in Epping Forest, briefly introduced the new partnership between her organisation and the Friends of Wanstead Parklands. She said they were delighted to announce the introduction of environmental activities for schools, families and community groups in Wanstead Park, Bush Wood, and Wanstead Flats. As well as the Friends, they would also be working with the Wren Group. The two-year project was funded by City of London Corporation’s ‘Enjoying Green Spaces and the Natural Environment’ strand of the Central Grants Programme. This funding would enable FSC, in partnership with the Friends of Wanstead Parklands, to run a programme of family activities in school holidays and weekends, community activities for local groups and environmental themed school visits. Friends of Wanstead Parklands had been delivering a series of children’s nature clubs and other seasonal events and were looking at how they can expand this offer to meet the demand from local residents. A survey was under way to ascertain what people want, and a particular effort would be made to reach groups who were not currently using the forest. Ms Robertson said: “We have been working in Epping Forest for almost 50 years and are delighted to extend our work into a new location and to a new community. We hope this project will inspire everyone to be curious, caring and passionate about Epping Forest and the Environment.”. Mrs Moxey then welcomed Colin Buttery. Mr Buttery took up his post as the City’s Director of Open Spaces in March 2017, following Sue Ireland’s retirement. Mr Buttery had been the Director of Parks and Deputy Chief Executive for The Royal Parks for the previous 12 years and had been involved in conservation land management for over 30 years. He had worked for the National Trust and Woodland Trust in a range of land management roles and the London borough of Bromley and the City of Westminster. He was also an ambassador for the environmental charity Keep Britain Tidy. Mr Buttery began by outlining his role as Director. He explained that his department’s remit involved managing the protection and conservation of the City of London Corporation’s green spaces in London and south east England. These include Hampstead Heath and various ancient woodlands, notably Burnham Beeches and Epping Forest. Other green spaces to fall under his remit include Queen’s Park, West Ham Park, the City of London Cemetery and Crematorium, seven “City Commons” on the border between Surrey and South London border and over 200 smaller sites in the Square Mile. Mr Buttery explained that the City of London had acquired several large open spaces by Acts of Parliament during the 1870s and 1880s. These had been vested in the City’s care on account of its longstanding record as a focus of charitable activities. Epping Forest had been acquired in 1878 and, in common with the other open spaces, had since been funded by the City using the interest from assets invested in the 19th Century. To give one example, the City Bridge Trust currently spent £20m per year other than on the upkeep of bridges, its original purpose. In recent years, the budgets of charities supported by the City of London have been under financial pressure with a need to deliver efficiencies. Funding granted by the City has reduced by about 25% over the last six years but self-generated income had increased to help maintain the forest and services delivered to the public. Mr Buttery said he had joined City of London about two years previously. However, Wanstead Park was well known in the heritage and landscape world, and he had long been aware that it required substantial investment. What he had not appreciated before becoming Director was that the real stumbling block to the restoration of the park was uncertainty over the status of the lakes under new flood management regulations. It was not until 2018 that the Environment Agency finally confirmed that the Wanstead lake cascade met its criteria for being classified as “high risk”. This meant that there was a potential threat to life, as well as property, in the case of an extreme flood event. An independent panel engineer had provided initial advice, but a further engineering report would need to be commissioned before a programme of works was finalised. The lake issue was now the main driving force for the Wanstead Park project. As the essential works would be a statutory requirement, the City would find the money from central budgets rather than from the budget of Epping Forest. However, other works to the lakes could be carried out on the basis that there was no sense strengthening the dams without addressing issues such as leakage at the same time. Such non-statutory works could then potentially be used as match-funding for a Heritage Lottery Fund bid to bring about wider improvements. Mr Buttery said that a proposal had recently gone through the City’s “Project Gateway” process to secure £150,000 for a scoping exercise to provide more certainty about costs. The timeline for the project was difficult to predict at this stage, but he suggested that an implementation period of perhaps five years might be realistic if all went smoothly, or eight years if there were hold-ups. Lessons from the Hampstead Heath ponds project would be used but, whatever the ultimate cost, Wanstead Park would certainly be “a big project” costing many millions of pounds. Mr Buttery kindly invited questions. John Sharpe commented that Mr Buttery had not referred to the Parkland Plan during his presentation and invited his comments on that. Mr Buttery said, that for reasons of time, he had glossed over quite a lot! The Parkland Plan incorporated a lot of work carried out over the previous 10 years. This included new research into the park’s history and various technical matters, as well as developing a vision for its regeneration and identifying costs. However, it was also important to recognise that there had also been practical improvements with important actions being taken in terms of day-to-day management. Mr Buttery referred to the long-term closure of the Temple the previous year as “unfortunate” and described the building as “underused”. He said that, while the gestation of the Wanstead Park project had been slow, there had been progress on issues other than the lakes and heritage, such as children’s play. Agreement in principle had been reached about provision of a playground site, but discussion was still needed about capital and maintenance issues with the London Borough of Redbridge. Councillor Paul Donovan observed that the work to be carried out on the dams in the park was a statutory obligation, which the city had to undertake. This was separate from the Parkland Plan and wasn’t really something the City could take credit for. Mr Buttery agreed that would be the case if the City intended to carry out a straightforward engineering exercise which amounted to no more than the bare statutory minimum. However, the intention was to do something which was in keeping with historic landscape and linked to the wider objective of bringing the site off the “Heritage at Risk” register. Mr Donovan said that research in recent years had shown that footfall in the south of the forest was higher than previously believed but this was not reflected in Epping Forest’s spending priorities. Mr Buttery replied that the number of visitors was indeed higher than Epping Forest had been aware. However, better data was needed across the forest and a survey company might be engaged to help with this. Geoff Sinclair, Operations Manager, said that Epping Forest had been recalibrating its priorities based on demonstrable needs. Councillor Jo Blackman asked whether there had been recent discussions with the Heritage Lottery Fund (HLF). Mr Buttery replied that the City of London had liaised closely with the HLF over Wanstead Park. There had been two or three meetings with Drew Bennelick who was in charge of heritage landscapes. A bid of £5m+ to address the heritage aspects of Wanstead Park was being contemplated. The HLF had been reconsidering its funding programmes, which was a complicating factor. Any application would now be for a Heritage Grant. This inevitably meant that there would be more competition, as the dedicated “Parks for People” scheme had been scrapped, and the application would come from the same pot as big national projects. Mr Buttery observed that the HLF now places a greater emphasis on interpretation and community benefit as opposed to actual restoration. In terms of match funding, statutory works could not be taken into account, but non-statutory works undertaken as part of the same program could be used. Stan Medland asked what the City was doing to protect Epping Forest from development pressure. Mr Buttery said that contributions from developers were being sought to mitigate the impact of new development in the vicinity of the forest, but that the forest itself was protected and indeed had been expanded by the acquisition of “buffer lands”. Gill James also commented that Epping Forest was under pressure from the growth of population and development, and from pollution. However, without it those problems would be much worse. Mr Buttery agreed, saying that when the City of London acquired the land it did not fully understand how important its effect on the environment would become. The City was currently working with the Mayor of London on ways to calculate an “asset value” for woodland and even individual trees to use in discussions with developers. The Mayor wished both to create new open spaces and use payments from developers to assist existing ones. Mrs James said that these matters took up a great deal of officer time in Epping Forest and asked whether more resources ought to be forthcoming to reflect that. Mr Buttery acknowledged the point and said that “some” more resources had been made available to reflect additional pressure of work. Jo Fensome asked what responsibility the City of London had to consult local people over events on forest land. 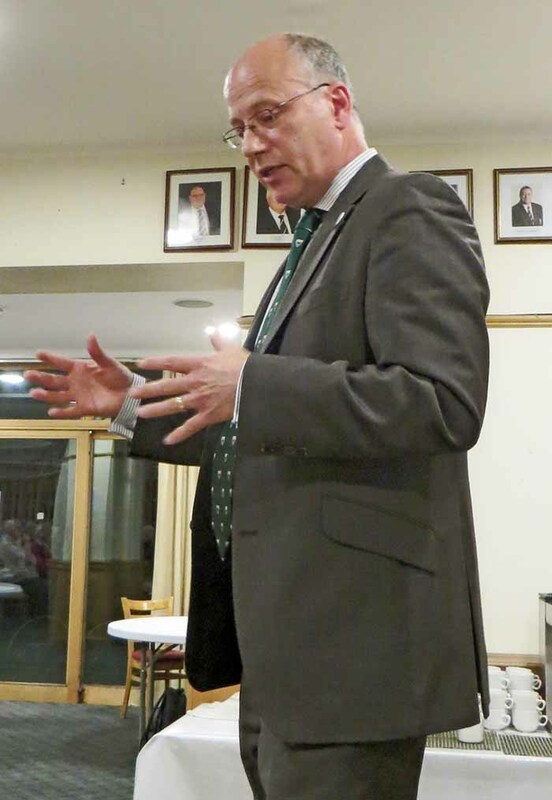 Mr Buttery said that Epping Forest dealt with local authorities as a landowner, and it was up to the relevant authority to contact residents within its boundaries. He acknowledged that sometimes this could mean that residents of other local authorities who were potentially affected were not being included. This issue was under consideration. Alan Cox said that the new benches by the tea hut were being well used, and indeed sometimes there was nowhere to sit. Geoff Sinclair said that the benches had been the installed through a FWP project funded by Tesco’s “Bags of Help” scheme. This illustrated how small pots of money could be tapped into to benefit the park. Tricia Moxey invited Verderer Nicholas Munday to address the meeting. Mr Munday was appointed Verderer of Epping Forest in December 2018 to succeed Peter Adams MBE, who died earlier in the year. Verderers are required to live in one of the ancient Forest parishes and not be serving members of the City of London Court of Common Council. Mr Munday lived until recently at Grade II* listed Hurst House in Woodford Green, one of Redbridge’s most important historic buildings. Said to date from 1714, it may have been designed by Nicholas Hawksmoor. Mr Munday has spent his working life as a solicitor and company director. Mr Munday told the Friends that, in being appointed as the fourth Verderer, representing the south of Epping Forest, he was very conscious of following in distinguished footsteps. The office of Verderer was an ancient one, going back at least to Norman times. Historically, the Verderers’ role had been to administer Forest Law. In mediaeval times “forest” was a legal term for an area maintained as a Royal hunting preserve, rather than simply describing an expanse of land mostly covered by trees. Forests were inhabited and managed, and Forest Law regulated the use that local residents could make of them. They were thus primarily legal and economic entities. Following the first Epping Forest act in 1878, Mr Munday said the role of Verderers was revived and redefined in line with the forest’s new status as a public amenity. Henceforth the purpose of the forest was to be more social than economic. Epping Forest was now a charity which was almost wholly funded by the City of London. Mr Munday said that the Verderers now sat on the City of London’s Epping Forest and Commons Committee, the role of which ranged from the protection of wildlife to the way people used the forest. He saw the role of the Verderers as being to listen, understand, and act as an advocate in two directions. They needed to explain why Epping Forest does what it does, by attending events and being accessible. They also needed to ensure that local people had a voice and that their views were transmitted back to forest managers and the City. Thus, they were in a position to assist Epping Forest in balancing its priorities as well as influencing the delivery of its policies. Mr Munday said he was a local person who had spent all his life in and near Epping Forest, particularly its southern section. He had spent some years living in Wanstead when his children were growing up. He said that the front page of the Friends’ website rightly said that the landscape of Wanstead Park was a work both of art and nature. Wanstead Flats was a “fantastic amenity” providing a range of sporting activities as well as being ideal for casual use by dog-walkers and others. In both sites, the challenge for Epping Forest was to balance the way they were maintained in order to respect history, amenity value and nature. Preservation of the qualities which made them special needed to be balanced against the expectations of local people. Mr Munday said he looked forward to working with the Friends and others to try to achieve this.